Today was Venice. That meant an early start to watch the sail in. It was almost as good as it was two years ago. Then we had a running commentary. This time we had nothing. I’m getting used to ‘nothing’ with Thomson. Cheap and nasty. However, Venice is always a great port to visit. Multinational, multicultural and a great place to get wedding photos taken if you’re from China, Japan or Korea, apparently. We got the ‘cooncil’ water taxi from just along from the ship to St Mark’s Square for half the price that Thomson were asking. Walked into the square and were amazed by the crowds. Just as amazed as we were the last time, and the time before that. The queue was starting to build for the Doge’s Palace, but Scamp noticed that there was virtually no queue to get to the top of the Campanile (bell tower). We’d never been up it before, so today it seemed the thing to do. First Surprise. You access the top of the bell tower by lift, not stairs. I’m guessing it’s possible to climb to the top if you are of that frame of mind, but we were happy to just let the lift take the strain. The lift was really smooth going up and the view from the top was amazing. It’s not really the top, it’s the viewing gallery at the top of the square tower, There is a tight little spiral staircase in a wrought iron cage that probably goes right up past the bells and into the pyramidal space at the very top, but unfortunately, the gate to the staircase was locked so we couldn’t go up. That’s our excuse and we’re sticking to it. 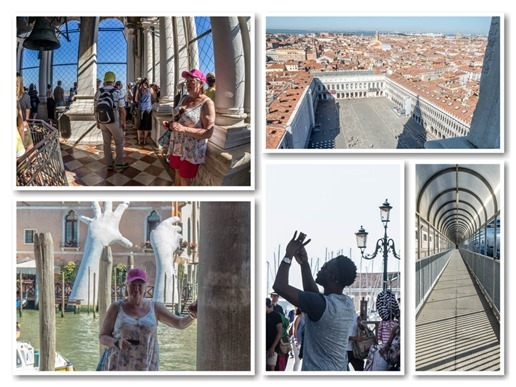 As you can imagine, we both took lots of photos of Venice from the top of the Campanile. Well, more photos of Venetian roofs than of Venice itself, but it was a great sight with views to the north, south, east and west. Second Surprise. The Bell Tower’s bells are there and intact. All greased and ready for action. I became a bit nervous as the big hand on my watch crept towards the 12, but it passed without a bell being struck. Scamp guessed that the bells don’t ring because of H&S. Too many people would be suing the city for bell induced deafness if they rang out in that confined space. All too soon it was time to go back down to earth. The lift was just as swift going down as it was going up, although Scamp noticed that the lift operator looked as if he was offering up a prayer! Maybe he was just hoping time would pass quickly until his lunch. Remember I mentioned the Oriental Weddings? When we got out of the lift there was a bride and groom getting in. Bride all decked out in her white wedding dress and groom in tails. What a strange place to get your wedding photos done, in a bell tower. 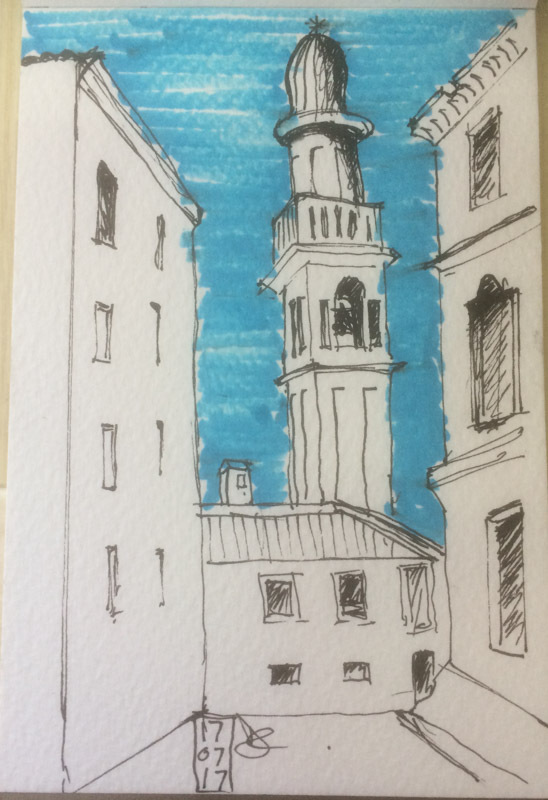 With our unexpected visit past, I tried a sketch of the Campanile, but if you sit anywhere in the square, you’re expected to pay an exorbitant fee, so I had to stand and I couldn’t get the perspective right, so I scrapped it and decided to try again when we came back. Scamp was on a mission to find a special cafe that sold Cannoli which are little pastry tubes filled with cream. We’d had them the last time we were there and Scamp was sure she could find the cafe. Like a bloodhound on the scent, she led us almost straight to the shop! Amazing! It was beside the Grand Canal, just down from the Rialto bridge. We both had Cannoli and cappuccino. A bloke sitting in the cafe looked over longingly and rubbed his belly and raised his eyebrows in a question. I smiled and just nodded. From the cafe we crossed the Rialto and followed our noses for a while. I was half looking for an art shop I’d been to the last time we were in Venice and I was hoping to get another sketch book there. Not that I really needed a sketch book, it was more the idea than anything. We didn’t find it, but we did find a square with a Leonardo exhibition. I wasn’t really interested in going in, but I spotted another campanile near by and managed a reasonable sketch of it. The sun was hot, but I found some shade under a tree to get the sketch done. However, I thought it was time we were heading back. On the way back we passed a wee pizza shop and, after some arguing about whether we should stop or go on, sat ourselves down at the only free table, ordered a pizza each and a carafe of red wine. I don’t know who spoke first, the bloke sitting next to me or me, but when I turned round, I realised that here was the man from the Cannoli cafe. I tried to explain and suddenly the penny dropped with him too. “Oh yes, the little pastry!”. It turned out he was French (Note capitalization = Nice Couple. We had earlier had a short conversation with a nice, quietly spoken American [same capitalization rule applies]). It turned out they were French but had a son who lived and worked in Glasgow “Good beer! Good whisky – Not Johnny Walker.” Our conversation was a bit stilted. He had little english and I had no French, but we got by. He asked what about Brexit and I told him I wasn’t in favour. Should Scotland break from england? Oh yes, we were both in agreement with that. Finally it was time for them to leave so we shook hands and Scamp offered “Bon Chance”. A reaffirming of the Auld Alliance. With the bill paid and a chance encounter under our belt, we headed back to St Mark’s and only had about 5mins to wait for the water taxi back to the boat. Got there and we both went for a snooze ready for the sailaway to begin at 6pm. Oh, the entertainment officer was almost wetting his pants with excitement, it was going to be a wonderful sailaway, one we’d remember for ever. Six o’clock came and went and still we were firmly connected to Venice by our pedestrian access umbilical. Also, there was no sign of the port workers who would undo the great ropes tying the ship to the bollards. Half past six and we were still waiting. Finally after sitting in the hot sun for forty five minutes without any message from the captain or anyone else, one bloke with a black bag appeared sauntering on board and the umbilical was removed, the port staff arrived and departure began. Thomson, you need to start a conversation with your passengers. You need to explain what’s going on, even if it’s bad news. Thomson, you’re going the same way as P&O. You have your ‘fanboys’, but thinking passengers like us will just take our money elsewhere. Dinner tonight was in Smash ‘n’ Grab again. It was Curry Night and it was lovely again. Smash ‘n’ Grab might be a bit antisocial, but the food is better than in the waiter service restaurant IMO. Danced to a couple of songs by Strumjam, then coffee and ‘white tea’ before bed. This blog and the previous two were brought to you by Free Zadar WiFi.